by Dagobert D. Runes Other · Dagobert D. Runes Author of introduction, etc. 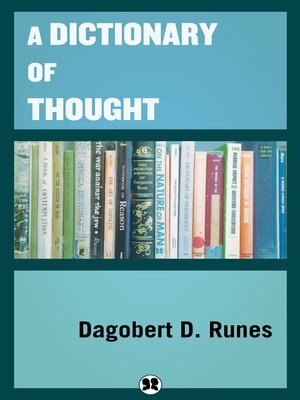 This dictionary, from the pen of the well-known philosopher Dagobert D. Runes, is offered as an attempt to define the borderlines of human thinking and human morality. In 152 pages organized alphabetically, Dr. Runes has created a dictionary of his own philosophical musings indexed by evocative words. Each word is followed by up to several single sentence aphorisms and occasionally a short essay. As a collection, they cover an extremely broad range of topics. In his search for real verities and true humanity, he takes the reader on an arduous thought-provoking voyage through the depths of the mind. This type of soul-searching philosophy, unburdened by traditional manner and terminology, is sometimes baffling, frequently of melancholy character, but almost always fascinating and inspiring.